The Second Apollo Moon Mission Was Almost Aborted Because Of? To Halt An Editing War, Wikipedia Had To Ban All IP Addresses Belonging To? Apollo 12 was the sixth manned flight in NASA’s Apollo space program and the second to land on the moon, but a serious incident during the launch of the rocket could have led to the Apollo 12 mission going down as a catastrophic entry in the history of manned space flight instead of a triumphant return to the moon. 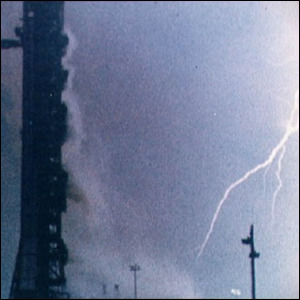 Shortly after lift-off on November 14, 1969, the Apollo 12 rocket assembly, capsule and all, inadvertently became the world’s highest, fastest, and most expensive lightning rod. Thirty-six seconds into lift-off, a bolt of lightning struck the spacecraft and startled the astronauts aboard. The rocket combined with the highly ionized plume of exhaust trailing it back to the launch pad proved to be a perfect path for the lightning to seek the ground. The ship’s control panels lit up all at once, instrument readings were incorrect, and while the system wasn’t offline it was essentially useless to the astronauts because it appeared like every system was active at once. Approximately twenty seconds after the first strike the ship was hit again. The second strike took the ship’s control main electrical and controls systems offline leaving only the auxiliary functions. The Apollo 12 crew was able to radio home to Mission Control, but Mission Control had little to say to them at first as the situation was unprecedented: the backup batteries in the ship offered the potential to get the capsule into orbit and then perform an immediate and risk-fraught return entry into the ocean. At this point it looked like aborting the mission and hoping to recover the astronauts alive was the best course of action. With roughly a minute left to decide whether or not to abort the mission and attempt the risky retrieval, a quick thinking environmental control engineer down in Mission Control, John Aaron, had a moment of extreme clarity under stress. While staring at his monitor and the strange data the malfunctioning system was spitting out at him, he suddenly recalled a similarity between what they were experiencing and a training simulation a year earlier. The instructions for which obscure switch to flip were relayed to the astronauts, and thankfully astronaut Alan L. Bean happened to recall the very simulation which had sparked Aaron’s memory. When the primary power was restored, Aaron was able to see what was going on aboard the flight, and he and the rest of the Mission Control crew were able to guide the astronauts through the steps to get the control system completely back online. On November 24, 1969 the crew returned safely to Earth and were recovered from the Pacific Ocean by the USS Hornet after a successful trip to the Moon.